For my the controls initially were not satisfactory, but hereinafter I discovered the whole topic of the configuration and adapt it to my needs. The initial configuration does the game more rapidly of controlling for a player who does not wish complications, giving facilities in the aim and the drafts. In general what I was looking for the maximum control, to the millimetre and Far Cry for Wii it gives it. We can shoot to a finger in concretely and it works. The speed of draft also successful well this one, though even it trumps in the moments of more speed of draft of the personage or before situations of many action for all sides. With this, Far Cry improves his cousin Red Steel. The end of the game, to a narrative level, is precipitated and well as to say it … of any form, there is no a forceful climax and there is no a logic. The things happen in a surprising way if, but without a sense in something previous. This way until the end, which is spectacular, but it had won more if it there was the polished one slightly more. The history tells itself as you play, since already it happened in the first Half Life, something that it is the most near thing the real life and without moving away from the traditional narrative. You find out what him happens to Jack and to all the personages. And I like this. Is curious that something is absent, that it has been said for active and for passive, and that already it was in the previous versions. The topic is the traps of branch, an option with which you can put branches of tree with thorns in other trees, to call the attention of a villain towards the trap and Zas! ; Also there was another variant that was to put a stake between two trees. To say that it is something original but for my effective little in a title that tries to be of action. This type of object, it breaks the pace. It has not imported his absence to my me, but it is of justice to emphasize that us this option is sold up to in the manual of the game and up to this one reflected in the controls of the same manual. East is second fact of that Far Cry has become rapid … very rapid since already we will see in the second part of this review, mas technical and deep. Third fact is since we could see few apprehensions or videos in his time. In fact the apprehensions that exist in the manual and in the box of the game they are the same apprehensions that sold, and do not correspond with the visual end. In the following part we will detail all these differences besides his possible reasons. The multiplayer online mode finally did not interfere, though to my personally it has not mattered for me, I am not a player online. Though it is true that great people enjoy thus. It more than possible reason of not incorporation is, not conclusion, on the part of Nintendo (in those dates), of the infrastructure of necessary network. The dubbing and the translation is like in all the Ubisoft’s games, excellently. The topic of the voices is true that there are times they repeat themselves a bit, but good the variety is not so crucial in a game of this type either. The commentaries that they make in general succeeded in the action that happens, others do not stop being understood, it is as if something was absent, probably it happens for the lack of ended plot, already spoken more above. The music is scanty and merely environmental. The compositions are not rich, only they serve to increase the sensations of distress, action or hunt. The environmental sounds or of objects, they are very achieved in general. To emphasize that major forcefulness is absent in the weapon or explosions. The environmental sounds are failed to take advantage probably, given the unrepeatable situation, since it is a jungle. End of the First Part: Game of a visceral way. Next Part: Game of a technical way. 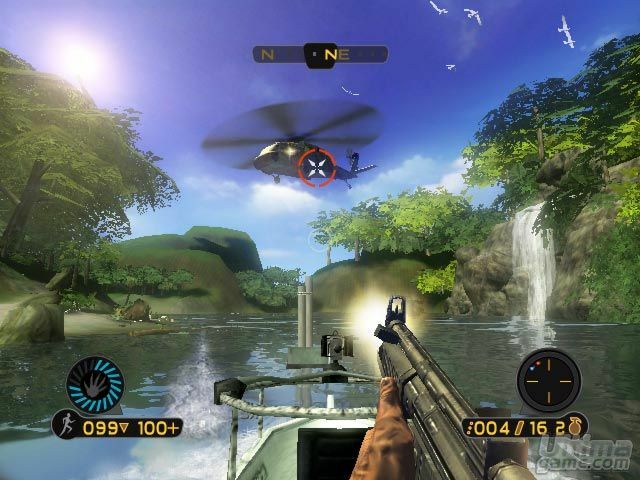 ← The Far Cry of the Wii also known like: Far Cry Vengeance 2nd Part.